Ladysmith Black Mambazo are more than a singing group; over the course of half a century, they have become legends of the international stage, and of world culture – a powerful and unique musical emblem of freedom and celebration whose first performances date back to an incredible 52 years. Founder and group leader Joseph Shabalala, grew up on a white-owned farm near the town of Ladysmith in KwaZulu-Natal, what was once the heart of the Zulu kingdom, and left in 1958 to find work in nearby Durban, where he joined a choir before setting up his own group, The Black Ones, in 1960, inspired by the vocal tradition of acapella isicathamiya singing, a style that originated among South Africa’s black miner workers transported far from their homes to work six-day weeks. On the seventh day, they sang. By 1964, following a series of dreams and regular success in local singing competitions, Shabalala renamed the group Ladysmith Black Mambazo – the latter word meaning ‘axe’, after their ability to cut down the competition. Their first album appeared in the early 1970s, the first of a catalogue that encompasses more than 50 recordings, but it was their role in Paul Simon’s Graceland in 1986 that finally brought them to the global stage, with platinum sales, three Grammy awards and 15 nominations to follow in an extraordinary career that has seen them work with artists ranging from Stevie Wonder to Dolly Parton and Taj Mahal. Today, the group spearheads a foundation to teach the tradition of isicathamiya to young South Africans, and continues to record and perform all over the world. With Songs From A Zulu Farm, it’s to their childhoods, their homeland, and to a world of innocence and joy, that they return with an album that dwells on their roots and native traditions. Songs From A Zulu Farm is the first of a trilogy of albums that sing of the group’s life experiences in South Africa, taking listeners back to the ways of life and nature of group members who were born and raised on the farms outside of Ladysmith. This collection of original and traditional songs that sing of life on the farm coincides with a world tour that brings them to Britain for an extensive, 26-date tour from 19 May to 22 June. 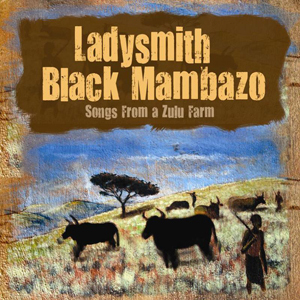 The album’s 16 songs are drawn deep from the well of the Zulu tradition, and begin with troublesome fowl, Yangiluma Inkukhu (The Biting Chicken) and some top-of-the-class animal noises from the group before they apply the familiar balm of Ladysmith’s matchless harmonies. Then comes Laduma, a praise song to thunder and to the power of the Zulu people and the voices of the group itself. And after the thunder, the rain, and the tender call of Children Come Home, its descending group harmonies and Joseph Shabalala’s counterpoint lead voice as warm and encompassing as a blanket and open fire. And so the journey through old-style Zulu farm life continues. Children splash about in puddles after the rain in Cabhayeye, with its skipping vocal rhythms and exhilarating splashes of lead melody. Handy hints for testing the safety of the river surface in Away You River Snakes, a song to chase away snakes and frogs with its account of throwing a stone into the water to read the ripples it makes. Ekhaya is one of several message songs that reflect on the nourishment of the group’s childhood memories in song, exhorting teenagers not to leave the bosom of heir families – and, perhaps, the tenets of life on a Zulu farm - too soon. Wemfazi Ongaphesheya continues the theme with a story of the pull and push played out between the strength of tradition and the lure of Westernisation. Pretty well every folk tradition in the world has songs of magic to encourage the crops, and Ladysmith’s Zulu repertoire is no exception, with Leliyafu exhorting the clouds to lift to let the sun shine down on the harvest, while the ebullient Uthekwane is an ode to ‘The Prettiest Bird’ who loves too much – her own reflection, that is. And so they end with a song that we all know, though never in such a sweet and honeyed a version as the isicathamiya makeover Ladysmith brings to the agricultural cornucopia of Old MacDonald that was, it transpires, a widely-known favourite in South Africa. For the Shabalala family, “Whether you are in Ladysmith, Virginia, or Ladysmith, South Africa, there are children being told – or being sung – stories that they will carry with them for the rest of their lives. These are the same stories and songs that they too will share with their children. We hope that these songs sung to children in South Africa can be shared with and enjoyed by families in other places in the world.